Using a soft touch generally no greater than 5 grams, or about the weight of a nickel, practitioners claim to release restrictions in the craniosacral system to improve the functioning of the central nervous system. CranioSacral Therapy deals very subtly with an important mechanics in our body. It claims to correct direct damage and trauma that our body receives from birth trauma, trauma from car accidents, trauma from sports injury and other traumatic incidences. 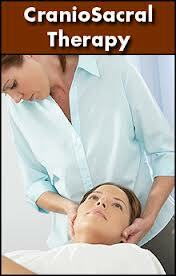 Therapy is conducted via a very gentle touch of the CranioSacral rhythm. This rhythm is created by a hydraulic fluid system called the CerebroSpinal Fluid (CSF) which is produced within the brain and spread throughout your head (brain and skull), face and spinal cord; with training and palpation, you can feel this rhythm pulse all over the body. In a normal healthy person, the rhythm is a “healthy” constant and strong, but under stress and trauma, the pulse becomes “unhealthy” by going into arrhythmic, poor circulation and resulting in physical, emotional and organic disturbances. CranioSacral Therapy is a gentle therapeutic modality that works by applying gentle pressure to the bones of your skull as well as your spinal cord and other areas of the body to provide you relief from pain to misalignment and arrthyms. At an emotional level, CranioSacral Therapy may produce a feeling of relief and “lightening.” An example is if a person underwent certain circumstances and/or situations that causes anger, frustrations, deep burdens, fear etc – these emotions are not a separate by-product that just disappears. They linger and “gets stuffed” inwardly and stored inside us, in many situations causing discomfort, pain, diseases and a general sense of being unwell or unhealthy. Through combining CranioSacral misalignments as well as your somatosensory history, we guide you through a release we work called SomatoEmotional Release.